EDINBURGH-BASED Richie Ramsay has encouraged Grant Forrest and his three fellow Scottish amateurs to make the most of their Highland fling this week. Forrest, Jack McDonald, Craig Ross and Daniel Young are taking on the pros in the SSE Scottish Hydro Challenge starting in Aviemore tomorrow. 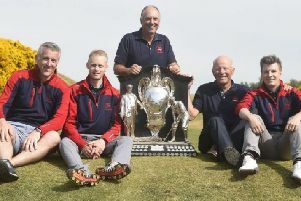 It’s the same opportunity Ramsay was handed in the event’s inaugural staging at Murcar Links in 2006, when the Aberdonian, helped by scores of 62 and 63, finished fourth behind Englishman Sam Walker. In addition to the amateur quartet, a number of young Scottish pros are getting a chance to test themselves against the current crop of Challenge Tour stars at Macdonald Spey Valley over the next four days. They include Royal Burgess ace James Ross, Renaissance Club duo Neil Henderson and Danny Kay and Blairgowrie’s Bradley Neil as last year’s Amateur champion makes his pro debut. “After winning the Amateur Championship, it’s been so good to get the chance to play in three majors and a bunch of European Tour events. That’s why I feel so prepared to turn pro now,” said Neil. “It’s the next step. I’ve made a lot of steps through the ranks in my short time as a golfer, but this is the biggest step and probably the most challenging step I’ll ever take. “But the way I played in the second round (a 73 in the US Open at Chambers Bay) last week gives me a lot of confidence going into the rest of this year as a pro. Another player feeling confident heading into this event is Bonnyrigg-based Jamie McLeary. He is a former winner, beating Italian Edoardo Molinari into second spot in 2009, and is sitting seventh on this season’s money-list on the back of a recent win in the KPMG Trophy in Belgium. He spearheads a bumper 30-strong Scottish contingent that also includes Archerfield ace Elliot Saltman, Turnhouse touring pro Duncan Stewart, Paul McKechnie (Braid Hills) and East Lothian man Raymond Russell. The event celebrates its tenth anniversary, having been a stepping stone for Ramsay and around a dozen others to become European Tour winners.